Over the past few years, the thrifting and sustainable fashion conversations have both been growing. …but are the two connected? Businesses seem to think so: 77% of millennials prefer environmentally conscious brands, and 35% are likely to switch to thrift for ethical reasons, according to a report by resale marketplace thredUP. And a study by e-commerce platform Lyst showed a 329% increase in searches for second hand luxury by ethically-minded consumers between 2017-18. Since we recently reinstated Instagram hashtag tracking on our social listening tool TRAC, we decided to dig deeper on that social data source: after all, the clothing and fashion conversations tends to happen on Instagram. and whether the sustainability and thrifting ones overlapped. We picked 4 different kinds of Instagram hashtags, associated with marketplace communities (#SecondHandFirst #PoshStyle), sustainable fashion (#SustainableFashion #FairFashion) and thrift (#ThriftFinds #ThriftFashion), with a couple of hashtags that seemed to live at the intersection of the two (#BuyLessChooseWell #SlowFashion) for good measure. The sustainability hashtags we picked defined a much broader Instagram conversation than the thrift ones. #SustainableFashion has over 3 million posts to date, and was the most used tag over the period we studied. 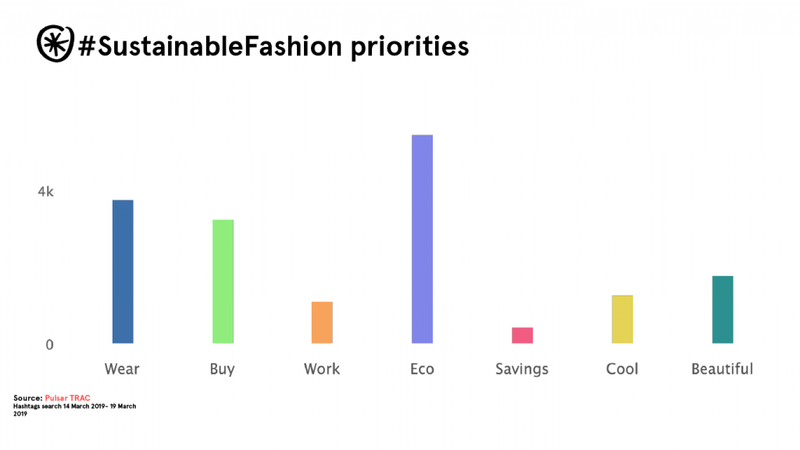 People using the #SustainableFashion tag make their interests clear – they also use #SlowFashion, #EcoFashion, #EthicalFashion, but they are also very interested in overall #Fashion, which appears in 22% of their posts. While the sentiment of thrifting is a clear theme here, the vocabulary is different – popular keywords used alongside this tag include ‘zero waste’, ‘second hand’ and ‘recycle’. However this interest in conscious fashion does not just apply to buying secondhand clothes: other popular hashtags used alongside #SustainableFashion include #Handmade #Organic #Vintage #Vegan. Thrift fans use a huge number of different tags on Instagram – from #Thrifter to #ThriftHaul, taking in everything from thrifted furniture to books. We decided to focus on two smaller tags, #ThriftFinds and #ThriftFashion to get a clearer view on the thrift fashion community. People pair these hashtags with others about selling clothes like #Reseller, #ShopMyCloset and #ForSale. #Vintage, #VintageFashion and #VintageStyle are also highly used alongside these tags. The sustainable tags also show up, with #SustainableFashion on 6.7% of posts we saw and #SlowFashion on 4.7%. Where do the two communities overlap? New marketplaces like thredUP, Poshmark and The Real Real are creating a place where sustainability and thrift meet. For instance, on Instagram #SustainableFashion and #Thrifted are amongst the top tags used alongside thredUP’s brand tag #SecondHandFirst. Meanwhile, tags like #SlowFashion and #BuyLessChooseWell are used by an audience who are creating a lifestyle from secondhand shopping for ethical reasons, alongside a host of other more niche tags that apply to a more conscious lifestyle #ConsumeLocal #SustainableLuxury #MinimalStyle and #ConsciousConsumer. The overlap between the thrift and sustainability communities on Instagram comes in this emergence of this new community, sharing attributes of the sustainable and thrifting audiences but with its own vocabulary and priorities to differentiate it. What items do people thrift for with the environment in mind? The AI also clusters the items into segments that match one another, which gives us a sense of which items are shown together. Some interesting outfits emerged: spring jackets paired with men’s hats, cardigans, overalls and robes; kimonos appeared with necklaces, earrings, maxi skirts and rompers. Segments show the activewear t-shirts, fleece jackets, blazers and hoodies were often paired together, giving the impression thrifters are buying everyday items, rather than fashionable pieces. It seems the outfits are as carefully curated as the conversation itself. One social post at a time.